Computation of physical interactions can be very demanding. There are optimization techniques providing high performance and overall stability for your interactive projects. Keep the global physics settings at a reasonable demanding level. To configure physics settings, open the Settings window by choosing Window -> Settings in the main menu and select Runtime -> World -> Physics section. Specify the Distance from the camera, from which physical interactions are not calculated. If the distance between the camera and the physics-based node exceeds this limit, the node freezes and its physical calculations are skipped until the node gets closer to the camera. Cloth, Rope, and Water physical bodies have their own Simulation Distance parameter as well. Using the Iterations parameter may increase stability, but can also result in a higher load. A high number of iterations may lead to noticeable lags as very time-consuming calculations are automatically skipped. One physics iteration is quite enough for simple scenes. Adjust the time Budget for Physics simulation. It is very unlikely that each physics-based object in your project will interact with all other objects. Most probably, objects can be divided into groups dedicated to certain tasks. If you have multiple objects that take part in physical simulation, divide the ones that are hardly going to interact with each other, into different "groups" by using the Bit Masking mechanism. 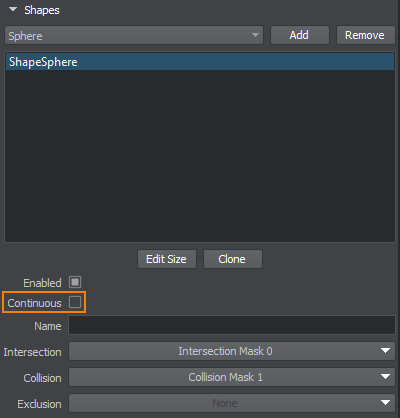 Set matching Collision Masks for those particular shapes, surfaces, and bodies that are expected to collide. If the masks do not match, shapes and bodies will simply ignore each other by going through. In Unigine, you can set up filtering accurately by using the Exclusion Mask. 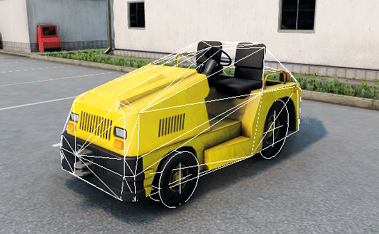 This mask allows ignoring shapes with the matching exclusion masks regardless of their Collision Masks. Surfaces that are not intended for physical interactions should have the Collision flag disabled. For example, a dashboard inside a cockpit would never take part in collision detection on the outside. Avoiding detection of undesired and unnecessary collisions is a basic way to reduce the amount of physical calculations. Specify certain physicals that should affect only corresponding bodies by using the Physical Masks the same way as for collisions. On the image below, a Physical Wind object affects a cloth banner but not a sphere. Intersection is a generic point of a specified area (or line) and an object. Calculation of intersection between a ray cast and a surface is fast and inexpensive and therefore sometimes can be used instead of computing collision. For example, calculation of collisions of car wheels with the ground can be simplified by using intersections. Although it is a programmatic approach only, it requires Intersection Masks to be set for filtering purposes. Both physical shapes and surfaces have intersection masks. 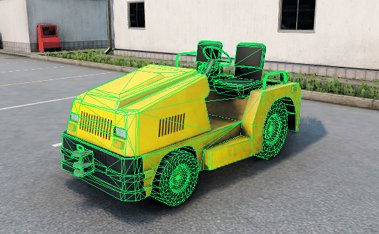 As a rule, most 3D objects should be represented by a complex and detailed visible mesh and an invisible simplified shape used by a physics engine for collision detection (collider). Physical shapes consisting of simple primitives make collision calculations easier while keeping performance high and accuracy acceptable. Therefore, it is recommended to approximate geometry with simple primitives (Sphere, Capsule, Cylinder, Box), which are faster and less memory demanding. 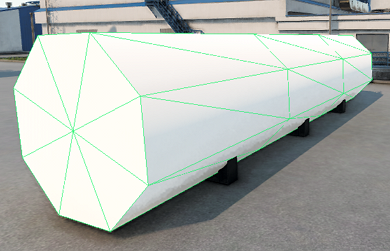 Complex shapes, such as Convex Hull and a set of autogenerated convex hulls, should be selected for representing complex and composite geometry when simple shapes don't allow achieving the desired goals. At the same time you should keep the number of shapes as low as possible in order to avoid heavy calculations leading to the performance drop. Remember that a shape doesn't have to duplicate the mesh it approximates. Even though primitives are not precise, in most cases they provide acceptable results. 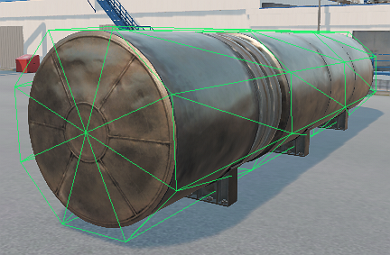 The simpler geometry is used for surface collisions detection, the more performance will be gained. If a mesh representing a physical obstacle has several levels of detail (LODs), the least detailed one is the most preferable for collision and intersection detection. Enable the Collision and Intersection options for this LOD and disable them for the other ones. 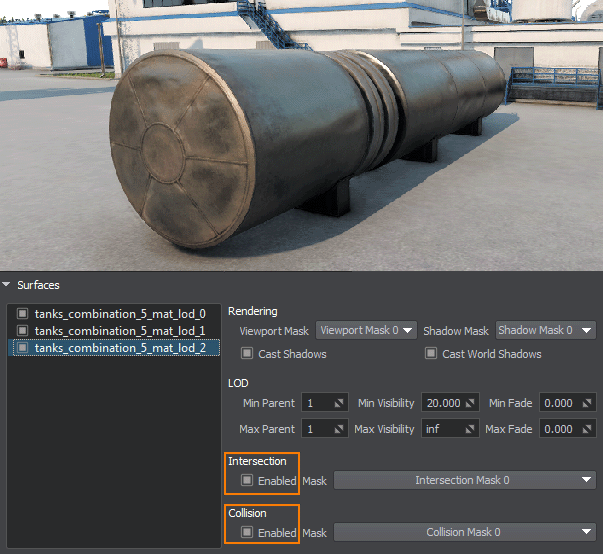 Disable the Collider Object option for the original node. Since now it is not taken into account by collision detection. Add a cylinder object to the scene by choosing Create -> Primitive -> Cylinder in the Menu Bar and cover the original mesh with the primitive. Make sure that the Collider Object flag and the Collision option of the surface are enabled for the primitive node. Hide the visual representation of the primitive's surface. You can do it either by clearing its Veiwport and Shadow masks or simply by setting its Max Visibility parameter to the negative infinity (-inf) — this ensures that the surface is not visible at any distance. Now the detailed mesh provides only visual representation, while physical interactions are calculated for the primitive cylinder. Continous Collision Detection is a very demanding operation, therefore, it is recommended to use this approach only for fast-moving objects and objects requiring precise calculations. In most cases, Discrete Collision Detection would be enough. For this purpose, select a shape and uncheck the Continuous flag for it. It is recommended to apply Freezing to all Rigid, Ragdoll, and Fracture bodies. This allows saving a great deal of computational resources by skipping physical calculations of immobile objects until they are affected by any force or object. Enable the Freezable flag for all types of physical bodies listed above. Set appropriate values of the Frozen Linear Velocity and Frozen Angular Velocity for each physical body or adjust the global parameters. These global freezing thresholds are compared to the ones set for each body, and the highest value is chosen to freeze the body. Adjust the number of Frozen Frames. The lower the value, the faster objects get frozen. Use the Volume Threshold parameter to reduce the number of fracture pieces. A code-based example illustrating how to remove (fade with the time) the fracture pieces from the scene can be found in the Physics section of the UnigineScript samples.